The pipe-to-ground is a distribution method for liquids and gases. Since a basic pipe is impassable, these are necessary to keep the factory open, as well as to cross belt lines, or environmental features. Only one fluid can be inside a pipe at one time, and the flow rate in pipes is heavily dependent on differences of fluid levels in individual segments. More complete information on handling fluids can be found on the Fluid system page. An example of a pipe to ground going under a patch of water. While pipe-to-ground is the developer name for the entity, the community has taken to simply referring to this entity as "underground pipe". This is the most common reference. 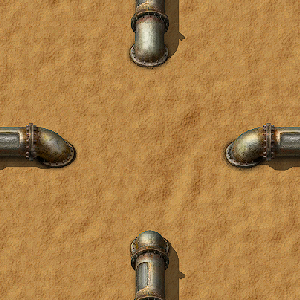 The maximum distance at which an underground pipe can connect is 10 tiles, resulting in a gap of 9 tiles in between. The gap between underground pipes does not store any fluids; a pair of underground pipes only has the same volume as two regular pipes, regardless of distance bridged. Underground pipes are now automatically placed at maximum distance when building by dragging. 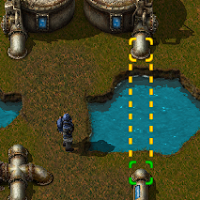 For two different pipe to ground types, the distance limit is now the minimum of the two connections. Pipe to ground can now reach up to 10 tiles underground. A pipe to ground can have multiple underground connections. Pipe to grounds are made in pairs, and are more expensive to craft. Automatic 180 degree rotation of underground pipes when the first pipe is built. Visualization of the connection between two underground pipes. This page was last edited on 10 June 2018, at 16:08.